The CPU fan of my Main (I have 3) computer, taken when replacing a hard drive, seen after 3 years of (almost) 24/7 service. The green "hose" on the right is a power connection: (my power supply has these bundled in UV reactive nylon) in this case, the "aux 12V" power connection. Taken by a Nikon D40x with an 18-55mm Nikkor non-VR kit lens. (at 52) Camera's on-board flash fired. 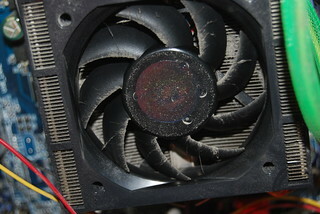 Neglected because of the dust accumulation... Needless to say, but after I took the picture, I blew out the dust!